Israel's blockade of Gaza is a clear violation of international humanitarian law, the International Committee of the Red Cross (ICRC) has said. In a statement, the ICRC describes the situation in Gaza as dire, saying the only sustainable solution is a lifting of the blockade. 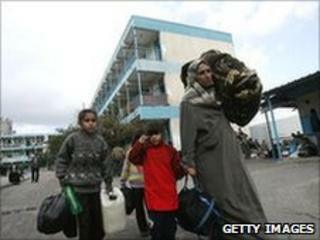 It says Israel is punishing the whole civilian population of Gaza. It also urges Hamas movement to allow ICRC delegates to visit a detained Israel soldier Gilad Shalit. The ICRC, a traditionally neutral organisation, paints a bleak picture of conditions in Gaza: hospitals short of equipment, power cuts lasting hours each day, drinking water unfit for consumption. "The whole of Gaza's civilian population is being punished for acts for which they bear no responsibility. The closure therefore constitutes a collective punishment imposed in clear violation of Israel's obligations under international humanitarian law," the agency said in the statement. And the ICRC blames differences between Hamas and the Palestinian Authority for some of Gaza's shortages. But the key message from the body which rarely publicly criticises governments is that Israel's blockade of Gaza must be lifted. That message is yet another indication of growing international concern over conditions in Gaza - just last week US President Barack Obama called the situation there unsustainable.